This is my last vacation week. Things started out boring enough. 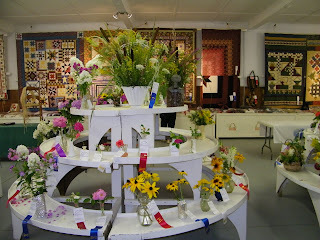 The only thing we had planned was going to the Annapolis Valley Exhibition. To you Americans I think it's your equivalent to a county fair. Charlotte was only due next week and she's usually a couple of days late. Tommy feeling better and in his new bachelor pad. Tommy had had a bad case of the poopies. It had been going on for a least a week. I tried everything. Deworming, changing his diet, keeping him inside on just hay and water. Nothing was working and he was losing weight fast. I think he lost a good 10 pounds. He was looking sad and listless. I was starting to worry. Wednesday we planned on going to the Ex. Ten minutes away from the exhibition is a great goat vet. 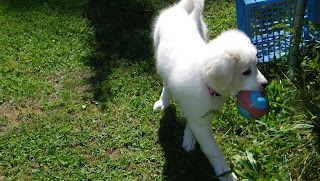 So I scooped up some poop, which is hard to do when it's water, and off we went. We dropped the sample off, gave our cell number and went to the exhibition awaiting a call. He was full of worms, eggs and coccidiosis. This was not good. We knew that it could be a life and death situation. They told us is could be treated, which was good. But at what cost? That's what we were wondering. I had read on websites that it could be expensive. 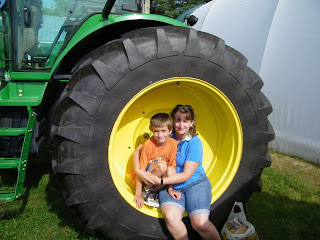 Plus, even though the girls had immunity to it now, we still had to treat them for the worms. Safeguard does not work anymore. Needless to say. We got to the vet and they gave us a whole bunch of well written out instructions, plus a HUGE bottle of medication and a smaller extra one for Tommy. In the instructions we have to give all the goats the meds once a day for 5 days. The extra one for Tommy smelled and looked like kerosene. It was nasty. Then I had to sanitize their stalls. Yeah...right.... How do you sanitize wood. So yesterday that's what I did, I cleaned the stalls, then sprayed them with Javex. Dave then powerwashed them. That's as clean as we can do. Tommy has to be put in another uninfected stall and can't go in the pasture for a few weeks, till he gets an immunity to the coccidiosis. But the best thing about all this is that it cost me a grand total of 26$ for all those meds and huge syringes. They never charged me for a call and the vet spoke to us for at least 20 minutes, didn't charge us for dispensing fees. Nothing. I couldn't believe it. The vets around here would have charged an astronomical dispensing fees, a service call and for the syringes. We were expecting no less than 200$. The next day Tommy was doing so well. His poopies are already back to berries. He's eating like crazy and I'm sure he's already gained a few pounds. So it all ended in a happy ending after all. Someone had lots of red ribbons! 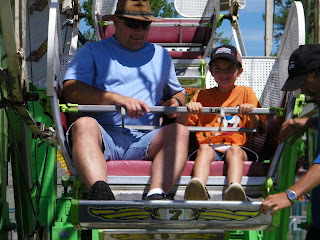 Dave and J. on the ferris wheel. The exhibition was fun. They had the wild and woolie sheep riding competition. J. wanted to go but he's too heavy. You had to be under 50lbs and he's 56. They had nice chickens there also. But someone had dyed their chicken pink and blue. It was just so wrong. 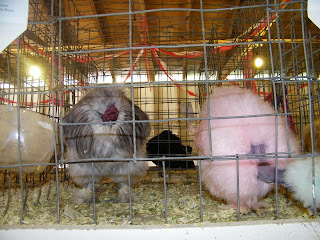 Blue and pink chicken. Just so wrong. 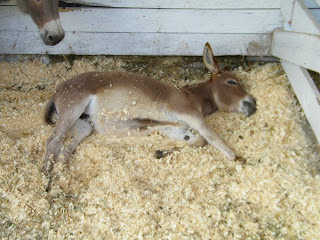 The mini donkey I want so bad. There was one thing I wanted soooo bad. A mini donkey. We all want one badly. But we don't have the time for one and they cost a small fortune. Someday when we're retired. Tundra is doing well. But she still pees alot. She listens better. 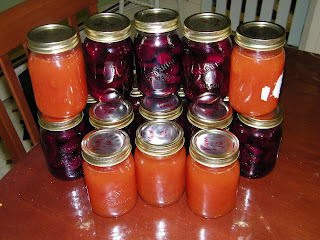 I've done lots of pickled beets and plum jam. 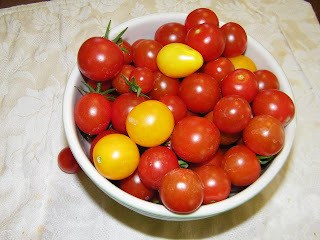 The greenhouse is full of cherry tomatoes. So some things did well. 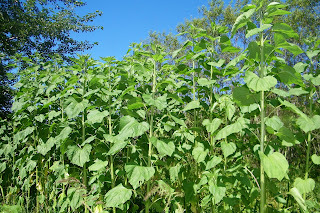 The sunflowers are finally getting buds. I don't think we'll get any pumpkins though. They were all false blossoms. Sunflowers super tall, teeny blossoms. Well that's my update for this week. Charlotte had 6 piglets on Wednesday. Mother and piglets are doing well. I guess we had the dates wrong. Or she was a week early. 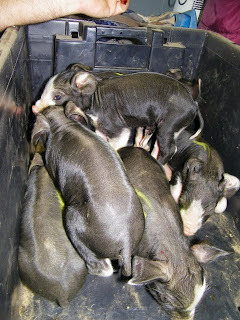 Six fat little piglets awaiting their needles. I hope your goat gets better. It looks like you had fun at the fair too. I hope this next week is much better. 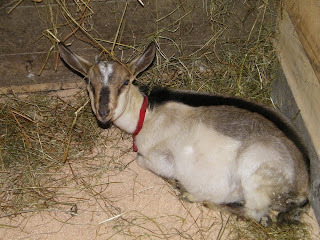 I'm so glad to hear that the goats are ok and that there were meds that worked and CHEAP! Tommy is very cute! Glad he is feeling better. Love those piglets. 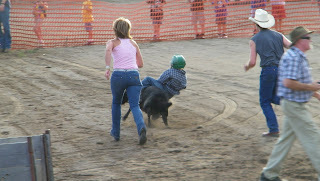 I'm sure missing having a pig this summer. Hopefully soon we will be able to get one. We're looking for a new supplier as the guy we previously purchased from is no longer selling. You're fair looks like a good one. Like to see the kids riding sheep! Why do you have to wait till retirement to get the donkey? Because we hardly have time for the animals we have now. And maybe by retirement we'll have saved up enough money to buy one and make room for one.